The probe station provides ease of measurement for devices with small electrical contacts. Small diameter Tungsten probes can be precisely aligned to contact pads with a microscope. The probes are attached to a moveable stage for testing multiple identical pieces. 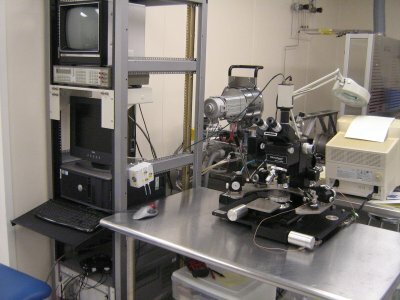 The stage has a vacuum chuck, and the microscope has four objectives with magnifications of 2.25x, 8x, 10x, and 20x as well as a camera for onscreen viewing. An HP 3457A multi-meter is provided which can be interfaced with LabView or other control software. An independent power supply, or other multi-meter with standard BNC connectors can also be used.